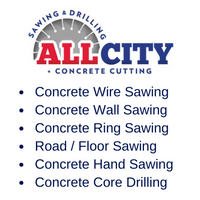 All City Sawing & Drilling is one of the largest and fastest growing concrete cutting companies in Victoria. Formed May of 2003 with just two employees, directors Scott Allan & Trent Luckman. We have since grown to a team of 20+ highly trained and professional staff. There is no job too large or too small for All City, commercial, industrial or residential. We service Australia wide 24/7, we offer same day, after hours and emergency services. Our services are currently being used by many of the major building and construction companies in the industry, including Multiplex, CPB Contractors, Lend Lease and Schiavello. We have a fleet of modern, reliable vehicles and equipment, and are continuously updating these to stay at the forefront of industry standards. We pride ourselves on reliability, quality workmanship and competitive rates. All our operators are highly experienced and fully trained.